Whether an antique or contemporary look, our custom armoires and cabinetry are handmade from fine hard woods and hand rubbed to a fine luster. 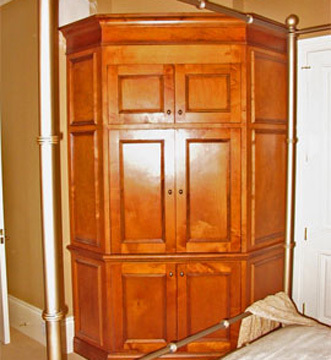 For this piece, our client lacked floor space for a conventional armoire, so we were able to design a custom piece that fit perfectly into the irregularly shaped corner of the room. As in all our work, a combination of solid, enduring construction and graceful proportion are key.